Before you start reading, Nox Populi has a multi-part series on what happened in 2012(parts one, two, and three) that you may find helpful and we recommend you watch. There is a second chance to get your own RSA message and key. Follow the "Numbers dot TK" hint to find it. There are many fake messages out there. Only messages signed with public key ID 7A35090F are valid. After the RSA puzzle, people who submitted the correct answer to their individual RSA puzzle (each person had different "n") to the onion page received another email with a MIDI puzzle. The MIDI puzzle and solution can be found there: http://pastebin.com/4nrDxVXk. Those who sent an encrypted PGP signed email with their words were later invited with the infamous "leaked email". From here, nobody knows what really happened, as the original puzzle was not very well documented in its end stages like the second puzzle was. Hopefully one day this will come to light, but after recieving this email every person that did so went completely dark, as if they had disappeared from the internet. Nobody knew how deep the rabbit hole went, but all the solvers could agree: it was the deepest they'd ever seen. What happened after this is mostly still not known, apart for few slips when some people told a bit more about what was going on later. Logs of those testemonies can be found on Unfiction.Legitimacy of those is not confirmed, it might be just trolling. After all, 3301 might not exist at all. We have now found the individuals we sought. Thus our month-long journey ends. Thank you for your dedication and effort. If you were unable to complete the test, or did not recieve an email, do not despair. There will be more opportunities like this one. 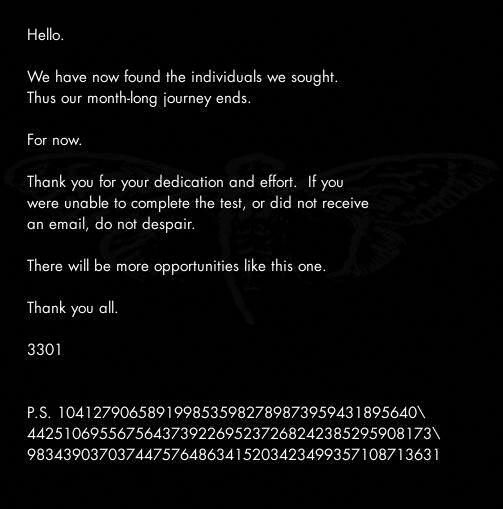 This was the final message recieved from cicada in 2012 that was confirmed to be them. Mentions of 3301 popped up throughout the rest of the year, and by december everyone had forgotten about it. Note: For any of the fake messages/speculations, please visit the appropriate pages from the main page.